In this new painting of a sunflower, the flower head is starting to droop a bit which makes an interesting painting. 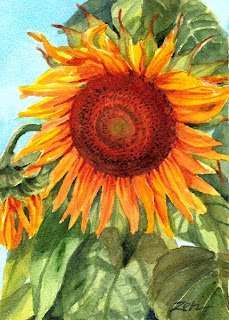 Sunflowers have so much character that they are fun to paint and make a beautiful image in most any stage of flowering! We had about a foot of new snow yesterday and the world was sparkling white in the sunshine today. With luck, it will stay until Christmas!